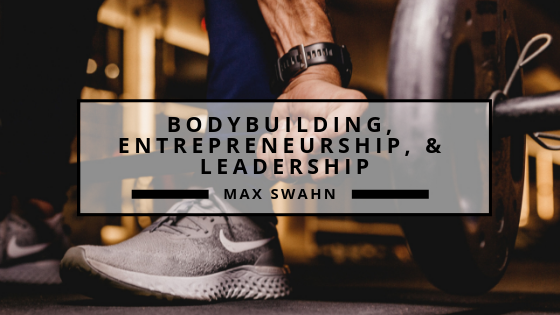 Max Swahn shares how bodybuilding can help you learn skills to improve yourself as an entrepreneur and a leader. When comparing the life of a bodybuilder to that of an entrepreneur, it may not seem as though the two would have a lot in common. However, that is simply not true. A bodybuilding lifestyle requires many of the same skills as an entrepreneur and leader. It is not surprising that an entrepreneur would be disciplined, organized, motivated, dedicated and have a competitive nature. But to reach the body’s full potential; a bodybuilder must possess and apply all these same skills. Managing and adhering to a strict diet of healthy proteins and fats requires tremendous discipline. A bodybuilder must be very organized when scheduling time for meal prep and workouts within the confines of daily life. It takes great motivation to constantly push to achieve the best version of him/her self. There is always something that can be improved. Goals are set and constantly evolving, but the ‘finish line’ is never truly achieved. The constant need to maintain or build something better is always on the horizon. A bodybuilder is dedicated to being the best. Whether that means constantly working to achieve the best version of him/her self or competing against others in a formal competition – the goal is to be better. Better than you are now. Better than your competition. As you can see, bodybuilders possess many of the same essential skills as entrepreneurs. But it doesn’t stop with just fitness. These skills can be applied to all facets of life. Not only do bodybuilders possess these skills and apply them to their fitness lifestyle, but many also carry that beyond fitness and apply these skills as successful entrepreneurs and leaders. Discipline, organization, motivation, dedication and competitive nature are indispensable skills whether you are a bodybuilder, entrepreneur or both. Max Swahn is an avid bodybuilder and engineer in Pittsburgh, PA. Max is an alumni of the University of Pittsburgh and graduated in April of 2018. Max Swahn has had the opportunity to participate in various engineering internships to help develop his skills and knowledge as an engineer. In his free time, Max is found at the gym keeping his body in shape with bodybuilding. How Can Bodybuilding Inspire You in Becoming a Successful Entrepreneur?